“Beyond the Sale is a comprehensive guide that will tell you exactly what you need to do to not only build a solid, referral-generated business, but to create a fulfilling and satisfying personal life…” writes Cheryl Richardson, New York Times bestselling author of Take Time for Your Life. 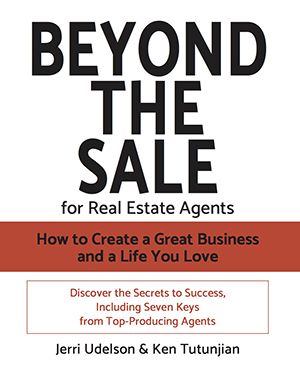 Plus, seven keys to success from top-producing agents and a wealth of inspiring anecdotes and real-world examples. “You’d be hard pressed to find two better experts to guide you toward a successful career in real estate than Jerri and Ken. Beyond the Sale is a comprehensive guide that will tell you exactly what you need to do to not only build a solid, referral generated business, but to create a fulfilling and satisfying personal life, too. If you follow their lead and do the work in this book, there’s no end to what you can achieve!"